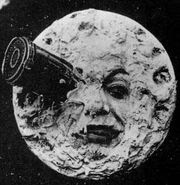 In 1913 Georges Méliès' film company was forced into bankruptcy by the large French and American studios and his company was bought out of receivership by Pathé Frères. After being driven out of business Méliès became a toy salesman at the Montparnasse station. In 1932 the Cinema Society gave Méliès a home in Château d'Orly. Méliès did not grasp the value of his films, and with some 500 films recorded on cellulose, the French Army seized most of this stock to be melted down into boot heels during World War I. Many of the other films were sold to be recycled into new film. As a result many of these films do not exist today. In time, Méliès was rediscovered and honored for his work, eventually taking up stage performance. The scene opens. 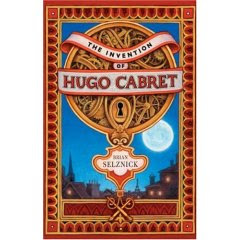 The moon sets and the sun rises over a bustling train station, so crowded, it's hard to differentiate one person from the other, but no...here is one Hugo Cabret, a wide-eyed boy looking furitively over his shoulder. Does anyone see him disappear into the walls, does anyone see him peer from behind the hands of a large clock at the doings of the station's toy booth, where he will pilfer yet another mechanical toy for parts to repair the mechanical man he has hidden away, an "automaton," rescued from a fire? If he can make the automaton work, Hugo feels sure its metal hand will write a note from his departed father, conveying a plan to keep him safe. But when the hot-tempered man in the toy booth discovers Hugo's misdeeds, and his notebook with cryptic sketches that the peddler inexplicably recognizes, all bets are off. Only the telling of well-kept secrets by all the characters can free them. "Sometimes I come up here at night, even when I'm not fixing the clocks, just to look at the city. I like to imagine that the world is one big machine. You know, machines never have any extra parts. They have the exact number and types of parts they need. So I figure if the entire world is one big machine, I have to be here for some reason. And that means you have to be here for some reason, too." My trip to Reading Reptile in Kansas City, MO for the DNA Festival of Children's Literature can only be described as transcendental. It was one of the nicest weekends of my entire life both as an author and as a reader. I got to speak to hundreds of school children, and also had the pleasure of speaking to educators and listening to other great talents present: the effervescent Pam Munoz Ryan (have you read RIDING FREEDOM, a great fictionalized chapter-book biography of the first woman to vote in California, years before any other woman, by disguising herself as a man?) Kadir Nelson (who is as beautiful and brilliant in person as his artwork is on the page), my new friend Mark Teague (who is not actually a dinosaur), a rare appearance by Paul Goble who traveled all the way from England, my favorite genius Brian Selznick, and dear heart Mordicai Gerstein, who I was especially excited to see so I could tell him how I had just recently read aloud his brilliant and under-recognized CAROLINDA CLATTER to a rapt audience of children (book review below). The Reading Reptile is a true traveling bibliophile's destination, a children's booklover's dream come true. Co-owner Pete is an Aslan-like kid-lit leader with an outspoken and sparkling wit, and kind, generous and patient angel co-owner Debbie is also a ridiculously talented paper-maché artist who uses her formidable gifts to bring favorite characters from books into our 3-D world, and going to the store was like getting to walk around some fantastic real-life Viewmaster. Honestly, I walked around and around that store eating up the eye-candy for at least an hour, and every time I took another spin there was something wonderous that I hadn't noticed before. From the handmade No, David! puppets to the room you can walk into that looks like a scene from James Marshall's George and Martha to the Babar fresco on the ceiling to paper maché scupltures of Harry the Dirty Dog and Tintin and Rosemary Well's bunny Max to a parade of characters inspired by Kevin Henkes to Shel Silverstein's The Giving Tree to Dr. DeSoto fixing a Fox's teeth and dragons and Daniel Pinkwater characters and Wild Thing Max and a stampede of gerbils flying from the ceiling, and...and...and...will you indulge me in a few photographs? Brian Selznick and Esme Codell: if they mated! See our love child? Even the seat cushions were inspired by children's books! Fun flying in from every corner! I think Harry the Dirty Dog inspired by Gene Zion's book was my favorite! On top of these wonderful opportunities to talk to folks, our posse of book-creators were treated to a home-catered meal of salmon and noodles and a sauce that was so glorious, it elicited tears, trembling and groans of joy. I promise you, I could not have enough film to capture all the delightful pieces in this haven. I thought nothing could beat Wisconsin's House on the Rock for sheer artistic inspiration, but Reading Reptile sure gave it a run for the money. Mordicai Gerstein made some resonating closing remarks at the presentations about the importance of imagination, and how we live in one another's imagination through the environments we create and the ideas we share. I just feel so blessed that I could walk around for a little while in Pete and Deb's imagination, and also meet their amazing children, staff, friends and family. When I say my links to Amazon on my wesbite are for informational purposes, I mean it; they may be a great resource for reviews and opinions, but walk into a place like Reading Reptile and you will see why independent booksellers have something that no chain or on-line seller can ever come close to replicating, and why they deeply deserve our support. This place had so much heart and warmth and a remarkable selection of books clearly chosen by people who knew what kids love, this store conveyed a real desire not only to sell books but to spread the pulsating and visceral joy, and P-O-W-E-R of children's literature. Reading Reptile is a living testament to how independent booksellers can build community and support the arts. After my visit, my new goals in life are a) to get better at working with paper maché and b) write something or be someone worthy of canonization in their magnificent and magical space. Going to Reading Reptile was like getting to stand inside a firework, a zinnia, a book come to life . I hope you all get to go someday. I will be speaking and signing at The International Reading Association (IRA) conference in Toronto next week, presenting on Wednesday a.m., in a session with Katherine Paterson and signing my favorite, VIVE LA PARIS at the Hyperion booth at noon....if you are coming, please do say hi! I can't wait. Wish me luck! Ah, I'll pace myself...a lot going on. I'll share in the weeks to come. And it has come to my attention that some young people in this country still have not read Rick Riordan's PERCY AND THE OLYMPIANS series (Hyperion)! Gasp! This is a very grave situation! Children MUST not miss out! This is our American Harry Potter, the thrilling chronicles of a boy who thinks he has behavioral disorders, only to find out that his father is a Greek god, thus making him a demi-god and prone to, uh, learning differences, and more than a few breathtaking adventures! Children can brush up on Latin and mythology subliminally, and best of all, the series has kids disappearing for hours to read, carried off and away by the fantasy. 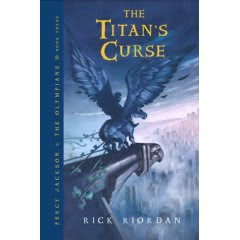 The latest one, THE TITAN'S CURSE, is out now! Get all three for perfect summer reading for ages 10 and up.